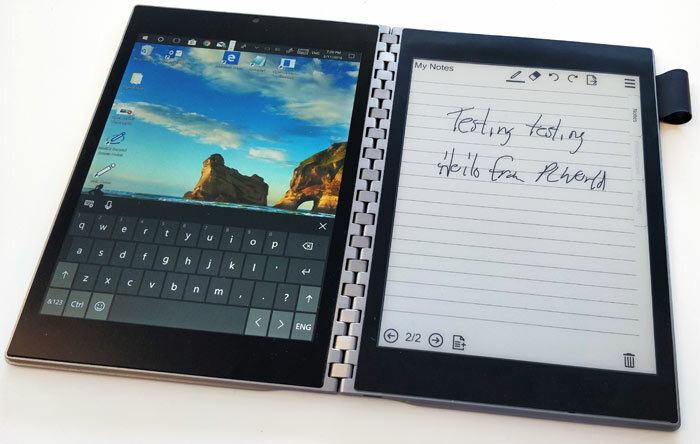 At Computex Intel is showing off a dual-screen folding PC concept which it has dubbed Tiger Rapids. This device packs two 7.9-inch displays; one an e-Paper display, and the other a more conventional FHD touch LCD. As pictured immediately below, the e-Paper display is seen to the right with a ruled page and some inking upon it. To its outer edge you can see the loop designed to carry around the stylus. On the left of the opened 'ringbound' book is the touch LCD colour screen. The above picture and much of my info come via PCWorld who talked to Intel's Gregory Bryant ahead of his keynote at Computex on Tuesday. More recently, just a few hours ago, Engadget tried out the Tiger Rapids prototype at Computex in Taipei and published a hands-on appraisal (video bottom). Inside the Tiger Rapids machine is a Kaby Lake Y chip and it also features an SSD, Wi-Fi, and an undisclosed amount of memory. A single USB-C port on its edge affords wired connectivity and charging and its 12WHr battery is said to be capable of supporting the device for 7 or 8 hours of usage or 13 to 15 hours, depending upon the source report. PCWorld says that the device is "skinnier than an iPhone 8 at 4.85mm thick," but that looks like the measurement when folded open. In the various pictures and video you can see the e-Paper display used for writing, extended screen use, or for hosting a soft-keyboard for typing. It is said to naturally afford itself for use as a note taking device and works well with Microsoft OneNote and the stylus for such tasks. Tiger Rapids has been in the works since at least 2015. It doesn't intend to mass produce and sell the devices but some designs at Computex are said to be inspired by Tiger Rapids, according to Intel's Bryant. I wonder if he means the Asus Project Precog, and the Lenovo Yoga Book 2 with dual displays. However, these examples use twin LCD rather than an e-Paper second display, so there may be other products in their early stages. Notebook Italia has made a video of this device now. It also talks about a new ‘smartphone sized PC’ with full Windows 10. This will probably go the same way as Microsofts Courier. I like it and would be interested if there was far less bezel.